EDINBURG — With every announcement of a new international event at the venue, H-E-B Park president Bert Garcia noticed the same comments on social media. Valley soccer fans were clamoring to see Club América, the Mexico City-based Liga MX squad with rich history and a winning tradition. On Tuesday, Garcia announced that H-E-B Park had finally made that a reality, reaching an agreement to host a friendly between América and C.F. Pachuca at 6:30 p.m. on July 4. Garcia called the match the biggest in H-E-B Park history, an accolade he’s repeatedly given out as the facility continues to expand its offerings during its second year of existence. 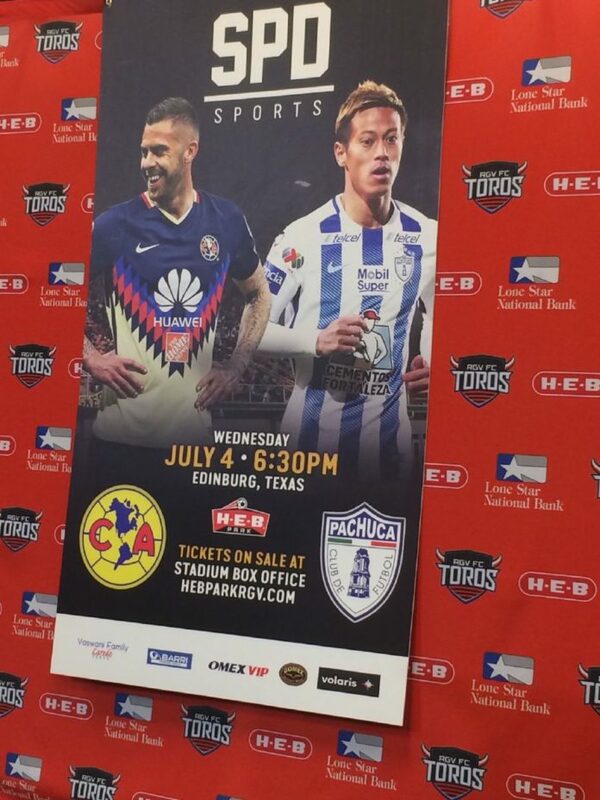 Garcia said he even attempted to secure América for the opening game at H-E-B Park last year. América has a record-tying 12 Liga MX titles and five Copa Mexico titles. The team has also won five Campeon de Campeones cups while securing 10 FIFA recognized club trophies, including seven CONCACAF Champions Cup/Champions League titles. Pachuca also has a history of success, winning six Liga MX titles and four CONCACAF Champions’ Cups. The rosters of both sides may be impacted by the 2018 FIFA World Cup, which runs June 14-July 15 in Russia. Group play ends June 28. In the past, H-E-B Park has played host to C.F. Monterrey, Tigres UANL and Club Deportivo Guadalajara, also known as Chivas. All three events were sellouts, approaching or surpassing 10,000 fans, including standing room only ticket sales. The venue has also welcomed Club Puebla, Pumas UNAM, Tiburones Rojos De Veracruz and a CONCACAF Scotiabank Champions League match between F.C. Motagua and Club Tijuana. Garcia said the venue is close to announcing a match between Santos Laguna and RGV FC on July 11. Garcia said the matches involving strong international brands are part of an effort to increase interest and attendance for the RGV FC Toros, who play their home games at H-E-B Park. According to data from Soccer Stadium Digest, RGV FC ranked fifth in the USL in attendance with 7,067 fans per match last season before dropping to 12th with an average of 4,909 fans so far this year. Garcia said the numbers are not a cause for concern, and that an increase is expected during the summer, when fans typically have more free time. A special attraction like América can also provide a boost, he said. Tickets for the match between América and Pachuca go on sale Monday at www.hebparkrgv.com.